Best Entertainment Corp. has combined the talents of our nation's top automotive journalists with a progressive west coast production team to deliver one of Canada's best Automotive TV shows. The biggest names in the automotive scene join forces with expert automotive journalists to bring you the next generation in automotive television: The New Driver's Seat. Freshly overhauled and restyled, The New Driver's Seat presents dynamic hosts and a polished high definition line-up that includes the latest in automotive news and trends, cutting-edge design and advancements in automotive technology. From the field, you'll get frank reviews and market comparisons as our team of experts travel around the globe, delivering fierce opinions on what's hot and what's not in the automotive industry. 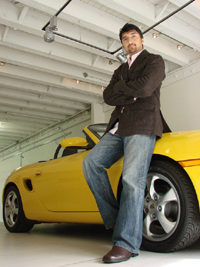 From the studio, our hosts (pictured on this page) tie it all together, inviting you to buckle up and get into gear for the latest in sleek high-performance and contemporary automobiles, motorcycles and classic luxury cars. This hot automotive series will entice you to get into the Driver's Seat! Click here to watch a preview of our latest season.